It only makes perfect sense for a basketball anime to make landfall in the Pearl of the Orient. Barangay 143 will be a gritty Manila-based basketball anime to air in the Philippines next year. Who’d have thought? Barangay 143 will be produced by the partnership of Singapore-based media company August Media Holdings, Japanese national broadcaster TV Asahi, and of course the local power of Philippines-based animation and game developer Synergy88. Basketball in the Philippines is a huge phenomenon. It is a sport so deeply ingrained in the country’s culture, there almost isn’t any family without a basketball fan. A living room is incomplete without someone wanting to switch the channel whenever Ginebra has a fight. Or whenever a fellow rival did. And according to Nike World statistics, around 40-million Filipinos (that’s almost a quarter of the 110-million population) play or have played the sport. It may not be a stretch to say almost anyone will remember out of stock knowledge that James Naismith invented the sport (because P.E.). If some Filipinos aren’t actively participating in “ligas” (both official and their own), they play on their own. Some even play videogames or even bet on actual matches. Commercials and energy drinks also have the iconic orange of a basketball, as well. And who can forget that the sport remains one of the pillars of inter-collegiate fame? Barangay 143 appears to have one season (so far, 13×44-minutes, or 26×22 minutes) and will be first voiced by an all-celebrity cast. It will also have a prime-time schedule. According to Animation World Network, August Media Holdings CEO Jyotirmoy Saha said Barangay 143 will be an action-sports drama geared towards young adults and prime-time aficionados. “Given the increasing popularity of animated titles among young adults, we believe time is right for South East Asia to deliver its first anime series of this magnitude for the regional and global markets. TV Asahi with their track record also makes the perfect partners for this,” Saha said. The anime will also have a consumer products line to follow the series’ launch during Spring 2017. Basketball jerseys, anyone? Barangay 143 will also be a “gritty” story about basketball, never giving up, and a “game” called life. Our protagonist Bren Park leaves basketball and travels to the Philippines when tragedy strikes his family. However, an encounter with the “legendary” Coach B in Manila tugs the iconic basketball heartstrings. On the other end of things, the Coach wants to seek justice or the death of his son at the hands of a syndicate. He will try to use basketball to pursue the culprits in a grand quest for justice. But how can he do it when his team so far is composed of a ragtag group of misfits? Bren and Coach B will cross paths in the most unexpected ways, and as AWN emphasized, they will find “peace, justice, forgiveness, redemption and love” through basketball. It seems a bit too “gritty” for a children’s show, but it’s got the right “formula” for a hit. A lot of prime-time content geared for children emphasize family values while still retaining drama elements. Instances like Juan dela Cruz do indeed emphasize values while maintaining quite the gritty storyline. Maybe Barangay 143 can pull it off – but will it fit a country so saturated with basketball? It actually depends (and you don’t want me to begin just how large the local anime culture is either). If Barangay 143 hits the right buttons, it can spark a revival of mainstream anime in the Philippines. Of course, the star-studded cast sounds awfully familiar to the Tagalog Bleach dub in 2007. It was hyped by a Starstruck (a reality show)-studded VA cast, and while it didn’t last long, the Bleach fandom stayed. However, it seems this collaborative effort is just a small step out of a large “conspiracy.” According to Nikkei, Barangay 143 is part of a growing effort on the part of Japanese anime companies to collaborate with other Asian partners to make new content for their audiences. Although Japanese companies are enjoying the success of their exports in the market, they are acknowledging the need for “familiar” stories to relate to. TV Asahi said they need to look at the demographic abroad. While a lot of fans are enjoying more mature anime, a huge percentage of viewers are children. But again, the success of such a landmark concept is a good risk. Japanese animation directly entering Philippine territory is a new thing. There we cameos before in other anime, but this is new. Banking on the basketball hype in the Philippines can jumpstart a new sports craze. And it seems Filipino fans haven’t forgotten hit sports anime either. A lot of us remember the realism of inter-school basketball (and Hanamichi Sakuragi’s red hair) in Slam Dunk. For sure, we also miss the cap of Prince of Tennis‘s Ryoma Echizen. A new arrival a few years ago is the Generation of Miracles from Kuroko no Basket. 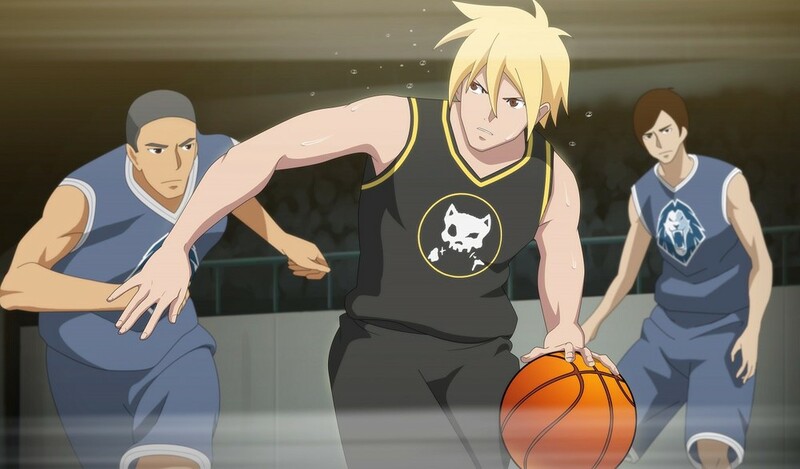 Could Barangay 143 make a new mark in sports anime? Barangay 143 will arrive in the Philippines with a Filipino dub in Spring 2017.